The PrintBall is like an Ink-Jet printer using a PaintBall Gun as printhead. The gun is mounted on a custom made pan & tilt unit. Who the heck is hektor? Hektor consists of a suitcase which contains two electric motors, a spray-can holder, toothed belts, cables, a strong battery and a circuit board which is connected to a laptop and controls the machine. The motors that are mounted onto the wall suspend the can holder through the toothed belts and define its position by changing the length of these belts. Through the use of Scriptographer, Hektor is controlled directly from within Adobe Illustrator, the spray-can follows vector graphic paths and sprays them onto the wall. The idea behind Hektor was to create a tool with its own aestethic. It was intended as a reaction to a monoculture in design, caused by the use of computers and the same few applications and techniques - all mostly based on vector graphics - by the majority of designers all over the world. Therefore, Hektor was to be a machine that conveys the abstract geometrical information contained in these clean vector graphics in a different way than normal printers do. Hektor follows vector paths like the hand follows a line while drawing it. Moreover, with the spray-can Hektor uses a tool that was made to be used by the human hand. Combined with the fragility of the installation this aspect gives the machine a less precise but somehow poetic quality. Ambiguous on purpose, Hektor unifies this quality with the purity of technological perfection. Gordon Bennett! Fantastic robots out of everyday objects like parking meters. OK, maybe not every day objects for people living in Singapore - parking meters became extinct here in the great parking riots of 52. 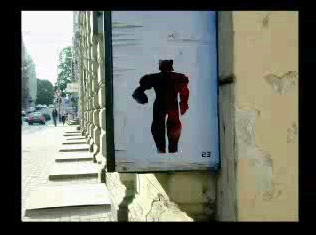 Individual frames of a walking robot are stenciled at various locations somewhere in Latvia as far as I can tell... then photographed and played in sequence. Nifty. I've been looking for an autonomous robot that can produce paintings and drawings based on randomness and stigmergy for a long time. I'm very interested in stigmergy - unfortunately I can't find anything about stigmergy on dictiuonary.com. 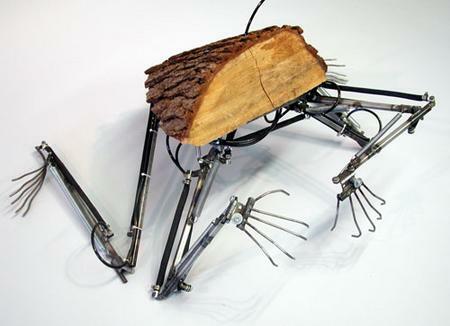 Bionic Log is a pneumatic robotic sculpture built around a section of tree trunk. Inside the log is a bank of pneumatic valves driven by a simple microcontroller program. These valves permit the flow of compressed air to the actuators in the limbs of the robot, which contract in a manner very similar to animal muscles. Although the control mechanism is simple, the resulting motions are very recognizable as human gestures, albeit the gestures of a confused or wounded person. Bionic Log is an extrapolated collision of the conflicting human imperatives of expediency and sentimentality, at once supporting and disproving the comforting notion that technology can solve any problem.